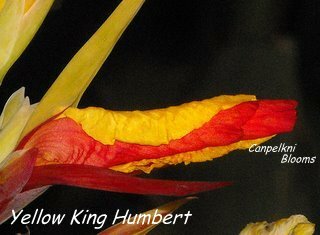 Canna Yellow King Humbert is a heirloom canna that for so many years has been called by so many different names, the most common name it is known by around the World is cleopatra. The name cleopatra is incorrect, research reveals that the correct name for this old cultivator is Yellow King Humbert. The earliest reference I could find for Yellow King Humbert dates right back to 1916 from the United States of America. 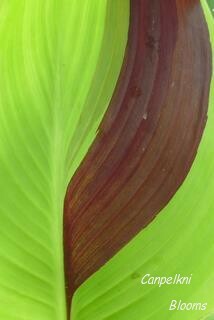 Yellow King Humbert would be the most unusual and unstable canna plant there is. This fascinating canna proudly shows off his huge exotic garden flowers and tropical foliage in an array of constantly changing combinations of many different forms. With large spotted flowers of yellow that are overlaid with many elongated red dots, now for why he is so unusual these flowers often have a red streak through them or they are half red or half spotted. 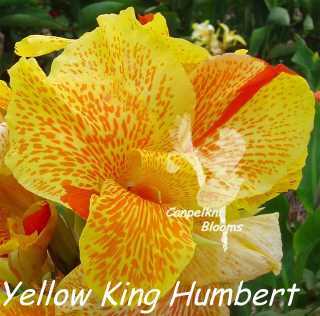 Yellow King Humbert also has striped flowers. When the flowers appear with stripes the size and length of them do vary. Sometimes they are only thin and go all the way through the staminode while others are thick but don’t go all the way through. Sometimes the cultivator will also throw in a completely red bloom amongst the spotty ones on the same flowering head. Rarely when his mood is right he will produce a head all red blooms. 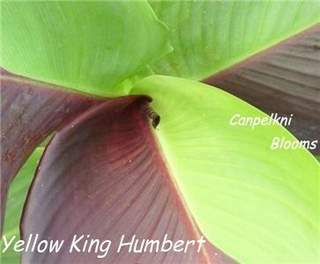 Canna Yellow King Humbert is sterile and therefore does not set any canna seed. This is a tall growing canna and Ive had it reach up to 1.8 meters tall. This height is measured from the ground to the top of its flowers. 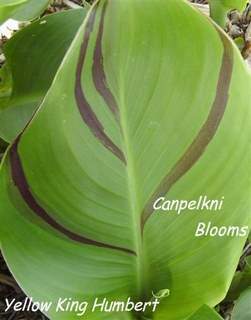 With tropical foliage of broad green leaves that often show a few dark purple sectors through them, this is also seen sometimes on flowering stem. The sectors can range from a single stripe or multiple stripes to half and half of leaf coloring, foliage alone is magnificent when he decides to shows these sectors. With fabulous variegated flowers and foliage to behold he would be one of the most unusual of all exotic plants available. Another little surprise that he does on rare occasions is to produce a sport. A sport is when a plant produces a new whole new different plant with a different leaf coloring or a different flower color to the original that it grew off. Canna Yellow King Humbert is a also sport from the 1908 cultivator Roi Humbert which translates in english as King Humbert. From 1916 Yellow King Humbert. 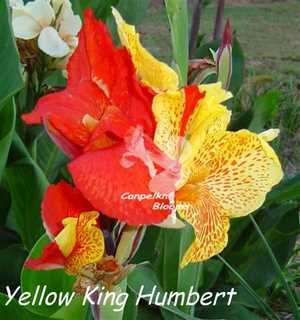 A Sport from the famous King Humbert having green foliage, and flowers of a beautiful yellow spotted crimson. In all other respects it is just like King Humbert. A great acquisition. 50c each. As advertised by John Lewis Childs, Floral Park, New York. This picture shows a yellow spotted staminode still wrapped around a red one and two different colored petals, one red and one yellow that have just started to fold back and open. 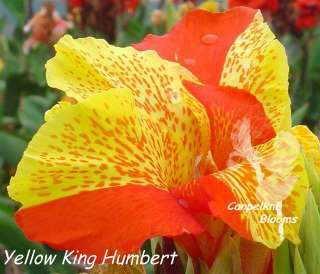 King Humbert is perhaps the best known canna in America today. Its splendid bronze foliage, its magnificent large scarlet flowers have been the source of great admiration upon the part of everyone who has planted cannas. Some two or three years ago there was discovered in the trial grounds of one of the largest grower of this country a single branch or shoot which carried green leaves and yellow flower and from this was propagated the stock of Yellow King Humbert. 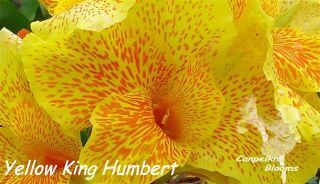 It possesses all the good qualities of the parent King Humbert, except that its gigantic flowers are a brilliant yellow dotted with red and the foliage green. 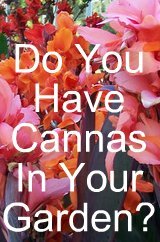 It is one of the most desirable of the giant flowered cannas that has yet been discovered. Strong 2 or 3 eyed divisions at 25 cents each; 12 for $2.50 post paid. A reference from a 1922 Henderson’s catalog describes him as a green leafed sport of the popular King Humbert a majestic stately variety. From a 1927 Vaughan’s catalog describes him as a orchid flowering sport of the well known variety King Humbert, some plants will occasionally give a scarlet or scarlet striped flower which we consider an improvement rather than a defect. Luther Burbank the world famous botanist appropriately gave the name Yellow King Humbert to this sport from King Humbert. 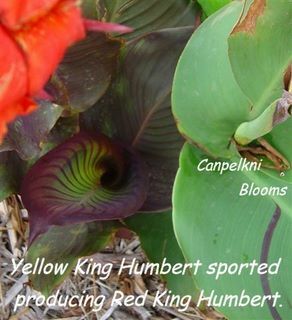 My International gardening catalogue references up to 1949 describe him under his correct name canna Yellow King Humbert; sometime after this his real identity became corrupt and lost for many years. 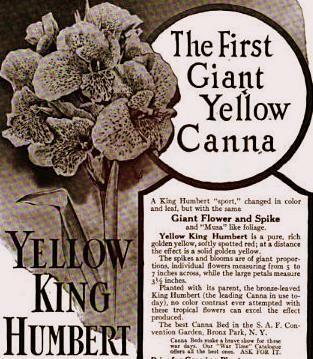 In Australia in the early 1930s Yellow King Humbert was still referred to by its correct name, but the name Cleopatra was also starting to crop up. 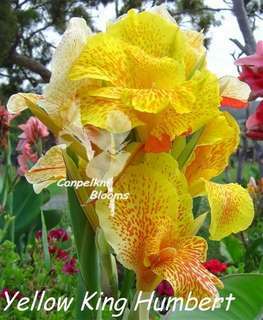 There is also a French canna called Cleopatre (note the E on the end) with apricot orange flowers, perhaps over these two familiar names this is how the name confusion started. I grow a few different strains of the Yellow King Humbert cannas but all the flower garden pictures on this page are from the same one plant. With spotted and striped flowers plus its irregular variegated leaves canna Yellow King Humbert would have to be the most unusual of the flowering cannas ever.